The controlled substances act of 1970. The influence of President Nixon and the “war on drugs”. Discussion of the ethics around clinical staff using medical marijuana. Can employers fire an employee who has positive urine drug screen for cannabis if they are prescribed marijuana? Should medical marijuana be treated differently than other prescribed medications? Sample policy on medical marijuana and recent legal white paper. Interactive group exercise in regards to whether a duty to report exists. THC and THCA, vs. CBD. Which cannabinoids are relevant and why only one type can be present in high amounts. The effects of CBDs on THC and everything you need to know about CBD. Introduction into the Michigan Medical Marijuana program: debilitating conditions covered. Marijuana usage – beneficial effects. Marijuana usage – effects to the respiratory and immunity systems. Marijuana usage – cancer causing research results. Marijuana usage – influence on mental health disorders, substance use disorders and psychosocial effects. Marijuana usage – injury, death and pre-natal issues. Discussion of the ethics around medical marijuana as it relates self-determination vs. safety issues. Medical marijuana parent and potential child custody issues. Interactive group exercise on a client with child custody involvement and on medical marijuana. 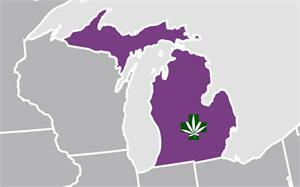 Discussion of the steps necessary to obtain a medical marijuana card in MI. Qualifying conditions and rates of referral for medical marijuana and usage of medical marijuana. Restrictions (public) to where a qualifying patient can smoke/vape medical marijuana. Discussion of the implications of Michigan's legalization of marijuana and Prop 1 details. Discussion of the ethics around continuing to treat a client with a diagnosed cannabis use disorder who is also on medical marijuana. How should a clinician/program respond if probation states that treatment is required for a medical marijuana client. Interactive exercise: medical marijuana and continued treatment with a client. This course is approved by the Association of Social Work Boards - ASWB NJ CE Course Approval Program Provider #87 Course #1964 from 07/30/2018 to 07/30/2020. Social workers will receive the following type and number of credit(s): Clinical Social Work Practice 6.